One of the world’s earliest cultivated fruits, dates grow in large clusters from the Phoenix dactylifera species of palm trees. The palms thrive in hot, arid climates and archeological records suggest they likely originated in Iraq, though their cultivation and the use of dates as food has been deeply ingrained in cultures throughout the Middle East, North Africa, and across the Indus Valley for thousands of years. Dates aren't easy to grow or harvest -- the female palms' flowers are typically hand-pollinated, and traditional harvesting involves climbing towering trees. But the sweet, nutrient-dense fruits are considered a worthy reward. Medjools are just one of many varieties of dates, but they’re highly prized for their large size, plump texture, and caramel-like flavor. Medjools are also arguably the most familiar cultivar in the United States, where they’ve been grown since the early 1900’s from offshoots imported from Morocco’s Oasis of Boudenib. Unfortunately, disease decimated the Moroccan and Algerian Medjool palms, though that story may have a happier ending, as at least one family of American growers has sent healthy stocks back to Boudenib to be replanted at the oasis. As for dates' cultural and religious significance, they are mentioned in the Torah as one of the Seven Species of Israel, and hold symbolic significance for Rosh Hashana, the Jewish New Year. And during Passover, dates are included in many recipes for the symbolic Seder food known as charoset -- especially versions that come from date-growing regions of the Sephardi and Mizrahi diaspora. 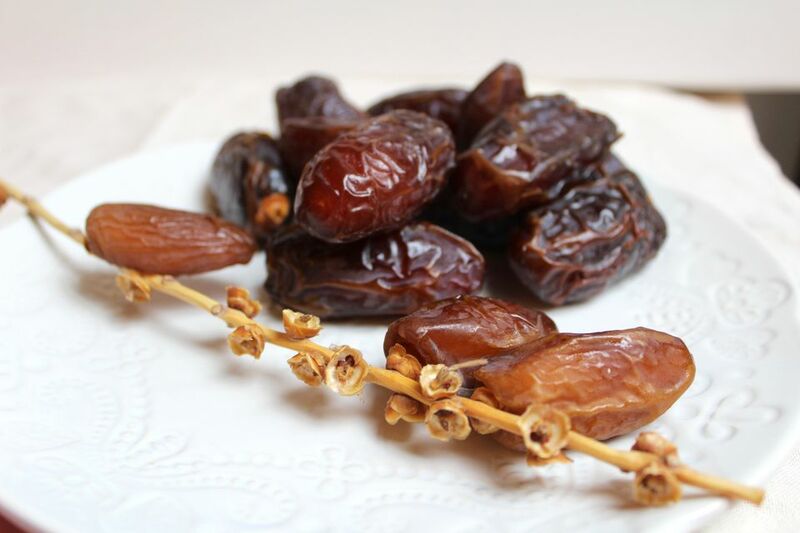 Dates are likewise mentioned in the Quran, and because they are favored for breaking the fast during Ramadan, they are a traditional fixture of the iftar table. Dates tend to make an appearance in Christmas dishes as well, which may speak to the association between palm fronds and Jesus. Sure, dates are undeniably sweet, but don’t discount the health benefits of nature’s candy. Unlike most sugary treats, dates are high in fiber -- just four dates provide almost 30% of the recommended DV (daily value) of fiber. Dates are also rich in important nutrients, including potassium, magnesium, niacin, and Vitamin B-6 among others -- nutrients that are essential for heart-health, nerve function, and promoting various important metabolic functions. For those that need to watch their blood sugar, a couple of dates -- especially when eaten with something protein-rich, like a small handful of almonds -- is a safer way to satisfy a sweet tooth than biting into a candy bar. Look for plump, shiny, unblemished dates that don't look dried out or moldy. (A bit of white bloom on the surface is fine -- that's the natural sugars rising to the skin.) Remember that most whole dates still have pits (they're too soft for machines to pit neatly), so take care when you bite into one! Better yet, remove the pits before you partake. Chocolate Hazelnut Stuffed Dates: Stuffed with homemade chocolate hazelnut paste, dusted with cocoa and cinnamon, and topped with a crunchy roasted hazelnut, these lush, multi-textured bonbons are healthful and elegant. White Chocolate Macadamia Energy Bars: For a grab-and-go breakfast or snack on busy days, these wholesome bars are perfect. They get their delicious goodness from whole grain oats, nut butter, and dried fruit. High quality white chocolate and chopped macadamia nuts add a touch of wonderfully indulgent flavor. Love to bake? This collection of muffins, quick breads and cookies will help you find the perfect way to incorporate dates into your baking. Green Beans With Pecans and Date Syrup: After a quick sauté with garlic and olive oil, green beans are tossed with toasted pecans and a drizzle of date syrup, (also known as date honey, or silan). Feel free to add slivered Medjools to add extra textural dimension and a hit of sweetness. Moroccan Lamb or Beef Tagine With Dates: This savory stew-like dish can be made in a pressure cooker, stovetop pot, or traditional tagine. Opt for oil instead of butter to keep it kosher. Roasted Simanim Tzimmes with Tahini Honey Drizzle: Roasted root vegetables, leeks, garlic, and dates get roasted together and topped with a savory-sweet sesame tahini drizzle.